Last spring some of the environmental and health clubs on campus sponsored an event called Climate Connections. Climate Connections has a "fairesque" with each club setting up their own booth. Today, we had another Climate Connections, which was set up by Vanderbilt SPEAR, or Students Promoting Environmental Awareness and Responsibility. Awesomely, they asked VIVA to set up a booth...which of course we were PUMPED to do. We decided to try out our vegan form of beer pong, which we righteously deemed Veg Pong. Instead of SOLO cups, Naty Light, and Ping Pong balls we decided to use recycled cups, Almond Breeze milk, and Trader Joe-Joe's candy cane oreos...the idea was awesome at first until we realized people would rather just eat the oreos (which I highly recommend going and picking up a box...NOW, they are SO addicting). Needless to say the veg pong was not as quite of a hit as we expected it to be, but at least the oreos and milk brought people to the booth. The other clubs represented were the Interfaith Council, Vanderbilt American Red Cross, SPEAR, and Vanderbilt Biodiesel. I learned today about the pretty awesome stuff that Vanderbilt Biodiesel does--they take the left over vegetable oil from all of the cafeterias on campus and create a multi-use soap from the glycerin byproduct, which they call "ecosuds". When my fellow VIVA member Julie and I stopped at the booth we picked up some of the enviro-friendly peppermint soap..I can't wait to use it. We also got a chance to meet some fellow veg friends on campus who didn't know VIVA existed...it's always great when I meet a new Vandy veg student whose interested in coming to meetings...hopefully they'll come to the vegetarian dinner next week. 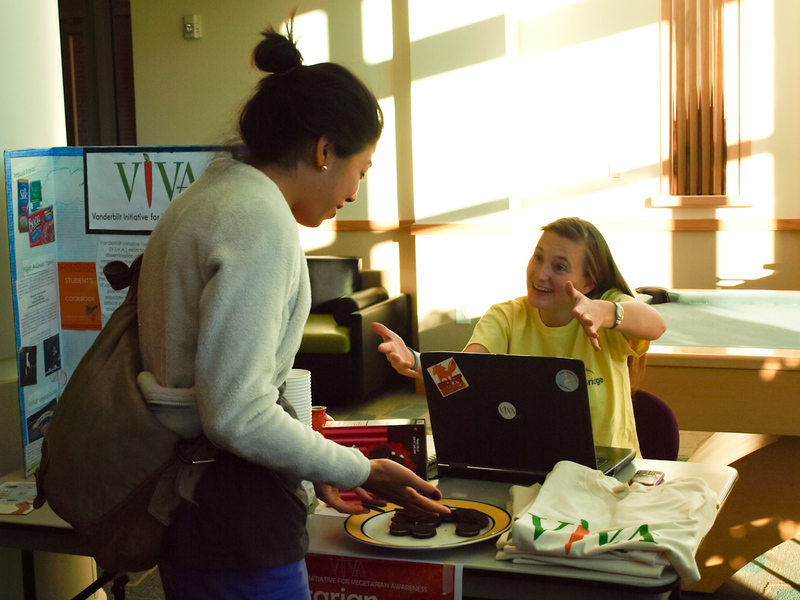 Here's a descent picture of our VIVA booth and our President, Danielle Williams, talking to a student. thats awesome! i love meeting other tennessee veggies :]] if your ever in Nashville I can definitely recommend some great restaurants!